"When flies start to eat, the intestinal stem cells go into overdrive, and the gut expands," said UC Berkeley post-doctoral fellow Lucy O'Brien. "Four days later, the gut is four times bigger than before, but when food is taken away, the gut slims down." Just as in humans and other mammals, O'Brien added, the fly intestine secretes its own insulin. In flies, intestinal insulin seems to be the signal that makes stem cells "supersize the gut." "Because of the many similarities between the fruit fly and the human, the discovery may hold a key to understanding how human organs adapt to environmental change," said David Bilder, UC-Berkeley associate professor of molecular and cell biology. "One strategy animals use to deal with environmental variability is to tune the workings of their organ systems to match the conditions at hand," O'Brien said. "How exactly this 'organ adaptation' happens, particularly in adult animals that are no longer growing, has long been a mystery." Following the surprising discovery of stem cells in the intestines of fruit flies five years ago, O'Brien and Bilder decided to investigate the role of adult stem cells in normal intestinal growth in hopes of finding clues to their role in vertebrates like us. "I looked at stained stem cells in the fruit fly intestine, and they are studded throughout like jewels. The tissues were so beautiful, I knew I had to study them," O'Brien said. O'Brien, Bilder and their colleagues discovered that when fruit flies feed, their intestines secrete insulin locally, which stimulates intestinal stem cells to divide and produce more intestinal cells. "The real surprise was that the fruit fly intestine is capable of secreting its own insulin," BIlder said. "This intestinal insulin spikes immediately after feeding and talks directly to stem cells, so the intestine controls its own adaptation." Stem cells can divide either asymmetrically, producing one stem cell and one intestinal cell, or symmetrically, producing two stem cells. 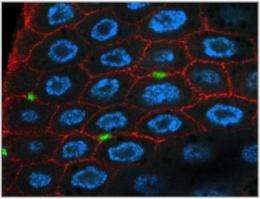 The team found that, in response to food, intestinal stem cells underwent symmetric division more frequently than asymmetric division, which had the effect of maintaining the proportion of stem cells to intestinal cells, and is a more efficient way of ramping up the total number of cells, O'Brien said. "Adaptive resizing of the intestine makes sense from the standpoint of physiological fitness," she said. "Upkeep of the intestinal lining is metabolically expensive, consuming up to 30 percent of the body's energy resources. By minimizing intestinal size when food is scarce, and maximizing digestive capacity when food is abundant, adaptive intestinal resizing by stem cells helps animals survive in constantly changing environments."